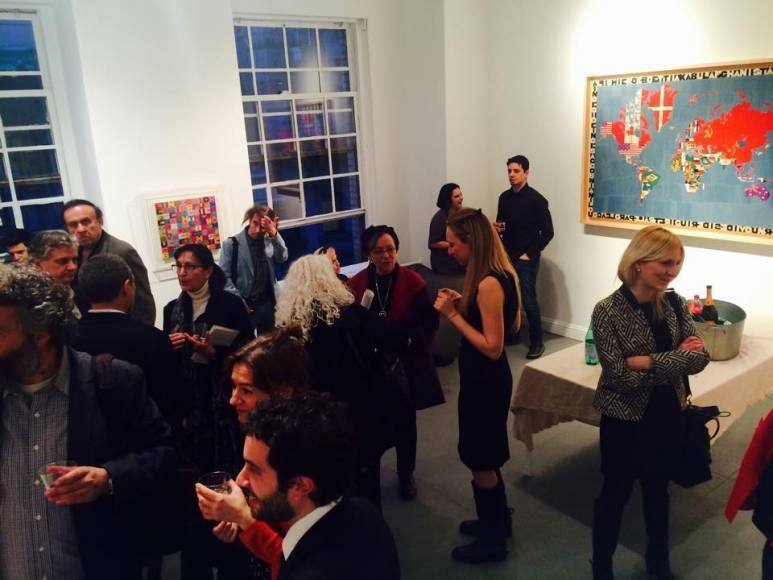 Ierimonti Gallery – Opening of "Alighiero e Boetti: Insicuro Noncurante"
Cesare Caini has been living and working in New York for over 7 years. He curated exhibitions for artists such as Alberto Burri, Roy Lichtenstein, Marc Chagall, Henry Moore, Marcel Duchamp, Joan Miró, and Jasper Johns, among others. Caini began his adventure in the field of art almost by chance, founding his own gallery in Milan when he was young. 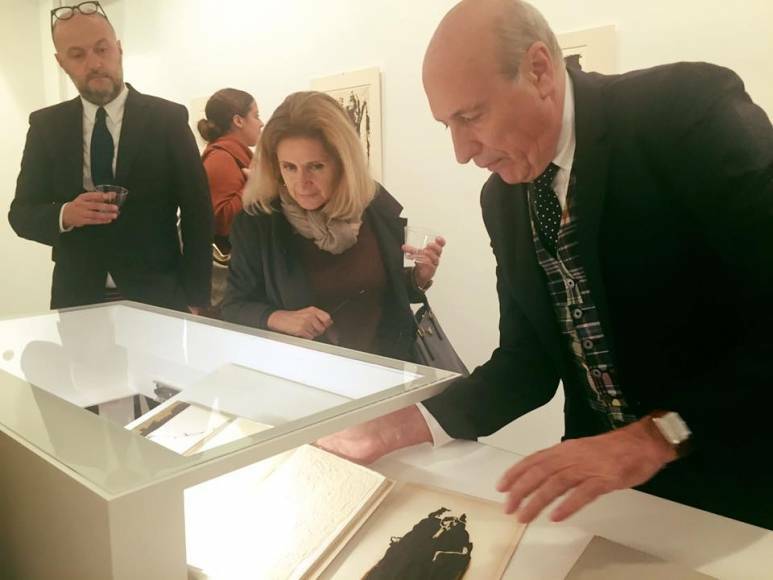 He published numerous catalogs including L’Eco della Stampa and Top Graphic. Caini has also contributed to Afro Basaldella’s catalogue raisonné. What makes his work unique is being able to distinguish between original prints and fakes, and being able to recognize artists’ signatures, discerning which are fake and which are authentic. “In the world of printing (but also in art in general) over 50% of what’s circulating is fake. It’s lucrative for the counterfeiters. Finding someone who knows how to distinguish these works of art from one another is like finding buried treasure. It’s extremely rare to find an expert because it’s an incredibly difficult job. It takes a lot of preparation and experience” said Cesare Caini. When did you realize that art would become a part of your life? Initially in Milan, I was working for a company selling machine tools with my brother-in-law, who was a painter. One day, the space next to ours was vacated, and my brother-in-law proposed that we open an art gallery together, 'Studio 15.' I was very young, and I let my brother-in-law manage it with his experience. After a year and a half, I decided to stop selling machine tools, and I moved to another space to open my gallery. This is how I ended up adventuring alone in this world. I then met collectors and art lovers that began taking me around to fairs and important events like Art Basel in Switzerland. 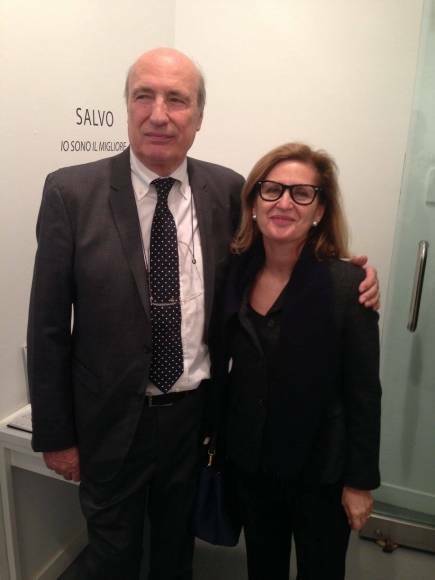 Mr. Galli became my mentor along with Luigi Rimondi. In the ‘70s, Rimoldi allowed me to meet artists like the Beker couple, Robert Morris, Morris Louis, Richard Serra, Sol Le Witt, Gilbert and George, David Hockney, Hamilton, Sutherland, Moore, etc. However, the meeting that became fundamental for me was the one with Alfonso Ciranna, a Neapolitan by birth but Milanese by adoption, a collector and seller of prints. He was the greatest expert on Italian prints that we had, and everyone would go to him, and now they come to me. He taught me how to distinguish authentic works from imitations and how to look at them in order to be able to tell them apart. He taught me about the differences in paper, printing techniques, and inks. Giorgio Upiglio, a printer in Milan, taught me a lot of the printing tricks! Was it from that moment that you decided to specialize in this sector in particular? As it’s said, la fortuna aiuta gli audaci (fortune favors the bold). When I began in the world of galleries, I started specializing in prints. I noticed that in Italy, through Alfonso Ciranna, nobody specialized in prints because it’s a very complex and difficult job. I then began following in his footsteps and studying because it’s a job that is never finished. Soon after, I also specialized in graphics and lithography. The first catalogs I “studied” were composed by Ciranna on Giacomo Manzu and Giorgio de Chirico. At that point, the range of my work began to broaden, and galleries called me for artistic consultations. Even today, when they need me, they still call me. In that moment of my artistic growth, I began to curate catalogs on shows such as those of Afro Basaldella, at the Museum of Modern Art in Udine. Do you have any stories for us? Many years ago in a gallery, one of my clients asked me for a consultation on a Mirò from 1934. I knew immediately that it couldn’t possibly be. I removed the frame, and I noticed that the paper was too white. And with art from that time, that wasn’t possible because the lithography is made from “greasy ink” and water. As the years pass, the fat from the lithography slowly permeates through the paper and goes through to the back. Additionally, if the back has an acidic backing, like cardboard or masonite, this further accelerates this phenomenon and transmits the acidity, which acidifies the paper. The color darkens and becomes a dark brown. Of course, the paper could have been washed. The correct time is “deacidified,” but that wasn’t the case with this work. It’s important to look, to have the eye, and to possess a deep knowledge. Why is it such a difficult job? Many galleries don’t have prints because they’re afraid of acquiring fakes, which are circulating in the market (almost half of the prints circulated are fakes). Competent individuals who are able to distinguish real from fake prints are extremely rare and heading toward extinction. Their young replacements lack experience, and therefore age. Young people can’t possibly have this experience behind them. How will they know the different types of paper, filigrees, the type of paper with the time period it was made in, the inks, the acids, etc… Paper made in the ‘70s can’t contain a print from Mirò, who was from the ‘30s. This is obvious, but identifying it, as opposed to simply being aware of it, is very difficult. Here in New York, a big gallery sold 10 Twombly prints with fake signatures, and I discovered them. I was able to get two back, but the other eight are around the world in the homes of collectors that don’t know, and perhaps never will know, that they are hanging fake Cy Twomblys from their walls. You’ve been in New York for seven years. What’s your role at the Ierimonti Gallery? My role is in curation: to organize shows, look for pieces, and go to collect them. We work with both public and private collections, so there’s always a lot of work to be done. 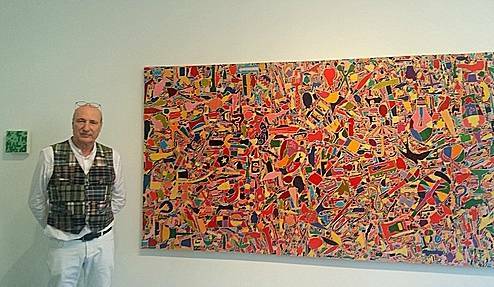 I’ve curated shows by Alighiero e Boetti (April 2015)–one of the most important artists of arte povera. It was very important especially because we had some of Alighiero Boetti’s prints; Alberto Burri, one of the great artists of the informal avantguard. The Alberto Burri, The Subject of Matter (October 2015) was a more intimate show in respect to the Guggenheim’s Alberto Burri: The Trauma of Painting. These two shows were very important in the international field of Italian art. Among others I curated shows like Fusion | Prints & Jewels (2015), a group exhibition that emphasizes the graphic works of some of the most important artists of the postwar period. Featured in the show we had Andy Warhol, Roy Lichtenstein, Tom Wesselman, Bruce Nauman, Christo, Edward Kienholz. How many collections have you curated between Italy and the United States? A lot. In Italy, some of the most important include, Fondazione Marconi Milano, Fondazione Sardi Torino, Fondazione Cavellini Brescia, Collezione Clerici Brescia, Lisa Panzera New York, Remotti Camogli (Genoa) Liguria. In New York, Fergus Mc. Caffrey, Francis Nauman. I often collaborate with Antonio Nogara–a collector for whom I curate works from Picasso, Warhol, and Roy Lichtenstein–the Gladstone Gallery, Naman on 7th Avenue, and the Gagosian Gallery in Los Angeles. I am one of the few people who can distinguish originals from imitations. There are very few of us. I’m able to recognize the difference between a false print from a real one. This is why galleries don’t have many prints. They’re afraid of buying fakes. Today, for every good work, there are two or three of them that are fake. Who is one of the artists that you admire most? The best printer is Kenneth E. Tyler, a a master printer, publisher, arts educator, and a prominent figure in the American post-war revival of fine art, limited edition printmaking. In Italy, we had Giorgio Upiglio, one of the great print houses where artists like Duchamp printed. I admire the work by Grafica Romero, an important print shop/lab founded by Renzo Romero and his wife in Rome in 1960, by Giorgio Upiglio Milano, and by 2RC in Rome. 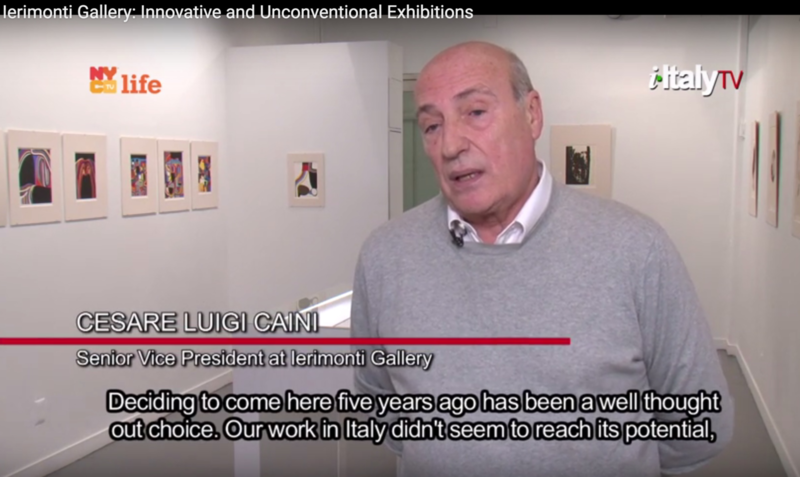 Click here to see the interview with Cesare Caini, which aired on NYC Life Channel.